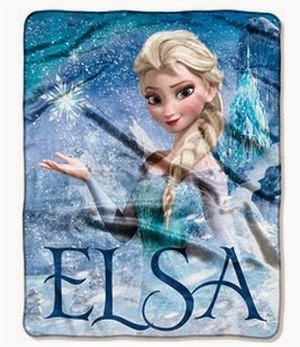 Disney Frozen Silk-Touch Throws - Only $9.96 + FREE Store Pickup! 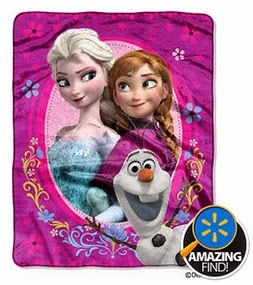 Check out this Disney Frozen Elsa Palace 40" x 50" Silk-Touch Throw and Disney Frozen Spring Zing 40" x 50" Silk-Touch Throw from Walmart.com for Only $9.96 ea. + FREE Store Pickup (availability depends on area). The Disney Frozen Elsa Palace 40" x 50" Silk-Touch Throw provides not only added warmth but fun decoration based on the popular movie. It is suitable for fans of all ages and can be draped over the bed, the back of the couch or used as a wall hanging. This Disney Frozen throw features a smooth border, a silky feel and displays the character of Princess Elsa in her signature blue dress, with a snowy mountain and Elsa's ice palace in the background. It also bears Elsa's name printed across the front. Made of polyester, it is easy to clean. It makes a striking and colorful addition to an existing collection of Frozen-themed decor.